The stars at night, they're big and bright — deep in the heart of Dallas! NEW: Download Big D’s maps of Downtown Dallas and The Cedars to help you plan your stay. Once you book your hotel room, it’s time to get excited about Dallas—an awesome city filled with art, history, music, culture, and BBQ. Because the Big Design Conference happens at the start of spring, you will have endless opportunities to discover the city. 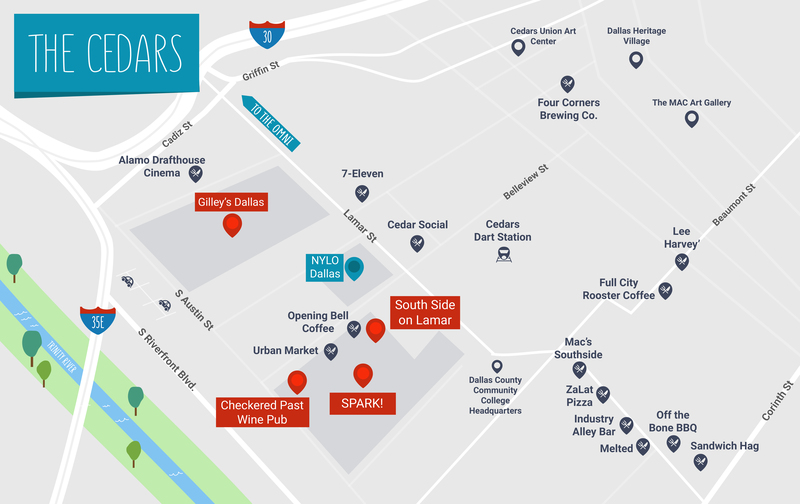 All conference activities take place at Gilley’s Dallas or within walking distance. Your most convenient option is to stay at a hotel near Gilley’s Dallas. We recommend the NYLO Dallas. Enjoy a show at any of these iconic, Dallas venues: Winspear Opera House, AT&T Performing Art Theater, the Majestic Theater, or the Texas Theater. Dallas has an awesome set of parks near our venue. Check out the flowers at the Dallas Arboretum, the fountains at Fair Park, or yoga at Klyde Warren Park. Cedar Social and Full Circle Tavern are near Gilley’s Dallas. Sit on the patio of a new food joint at Trinity Groves. Grab a burger at the Angry Dog in Deep Ellum. Visit the flagship store of Neiman Marcus. Find three floors of shopping at the Galleria. Do retail therapy at North Park Center or Highland Park Village. 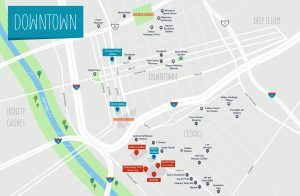 Vist the Perot Museum, Dallas Museum of Art, Nasher Sculpture Center, or Six Floor Museum to get connected to the Dallas art scene and something larger. Ride the bull at the Trophy Room. Listen to a band at Bomb Factory. Check out the Midnight Rambler, a speakeasy-style bar. Visit a new food joint at Trinity Groves.